This week, sellers on Etsy and eBay have begun offering items for the national nonprofit. The money will help those with the rare cancer of connective tissues. Nancy Lee Dunn is selling her homemade quilt to benefit the Sarcoma Alliance. It is vital to get a second opinion, especially when dealing with a rare cancer like sarcoma. 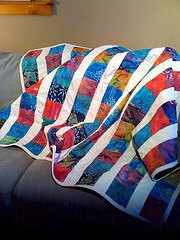 A colorful quilt can do more than brighten a winter day or keep a lap warm. For a sarcoma patient, it could pay for gas to go to a sarcoma center and get proper treatment. It could save a life, said Suzie Siegel, a board member of the Sarcoma Alliance. "It is vital to get a second opinion, especially when dealing with a rare cancer like sarcoma," said Nancy Lee Dunn, owner of Seven Sisters Gift Shop in North Creek, N.Y. She has a $130 batik quilt in her Etsy store, with proceeds going to the Alliance. Dunn, Siegel and others have started selling items on Etsy, eBay, Craigslist and other online services this week to raise money for the national nonprofit. Founded in 1999 in Mill Valley, Calif., the Alliance provides education, guidance and support to people affected by sarcoma. Its website lists comprehensive sarcoma centers; educates patients on how to get insurance reimbursements; and offers a grant of up to $500 to reimburse expenses if someone gets a second opinion from an expert. Dunn, an English teacher, participates in the Alliance's Facebook group in hopes of helping her sister-in-law with hemangiopericytoma, one of more than 50 subtypes of sarcoma. In 2003, her sister-in-law had an abdominal tumor removed. "The doctors said they weren't sure what it was, but to get a CAT scan in a year, which she did. No more follow up was recommended." In 2011, she had chest pains while running and went to an emergency room, only to find her lungs full of metastases. She checked her medical records and found she was supposed to be checked annually, Dunn said. "I think any patient diagnosed with sarcoma should go to a sarcoma center where they see this cancer frequently. I truly believe a knowledgeable medical team is an important factor in surviving sarcoma." Sarcoma is a cancer of connective tissue, including bone, muscle, nerve and fat tissue. It can arise anywhere in the body at any age, from newborn on up, said Siegel, who lives in Tampa. "I've made a resolution to pass on vintage items I never use to those who will really appreciate them," said the leiomyosarcoma survivor, who just opened the Sarcoma Alliance store on Etsy and put her first item on eBay. "I've also started making some jewelry with stones from Ed Gerber and Debbie McCoy." 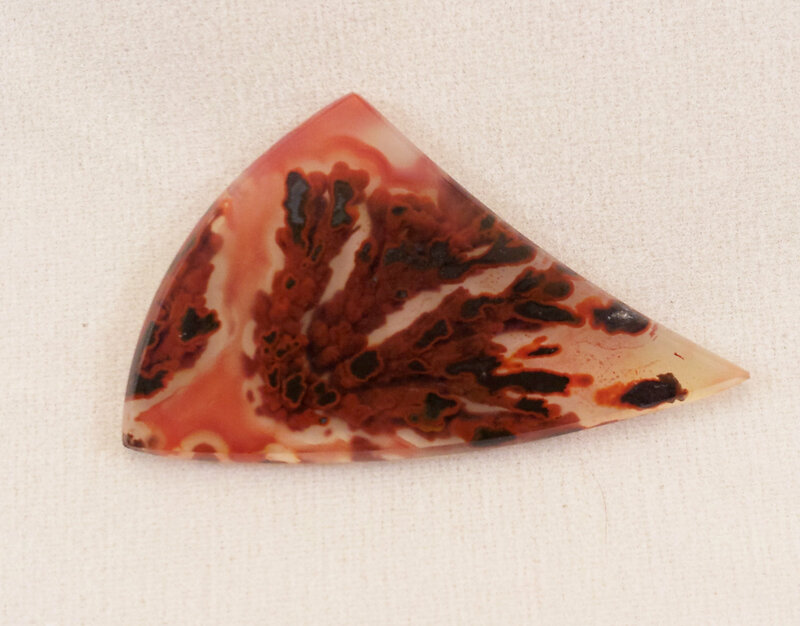 "Ed, who lives in the Dallas area, has cut and polished some rare and wonderful stones, such as the red-and-black plume agate whose sale will benefit the Alliance. It comes from the Woodward Ranch, which is famous for unique agates." "I am hoping that my small donation will help those that need it far more than I do," Gerber said. Siegel said she strings necklaces at the Tampa Bead Cafe, which McCoy owns. The store, which will soon sell supplies online, has long tables in which people can work on their projects together. McCoy said she welcomes cancer patients and others struggling with health issues. "You can leave your worries at the door, and just relax amid all the pretty colors and play with the beads with friends and family, 'cause when you are here, you are family. 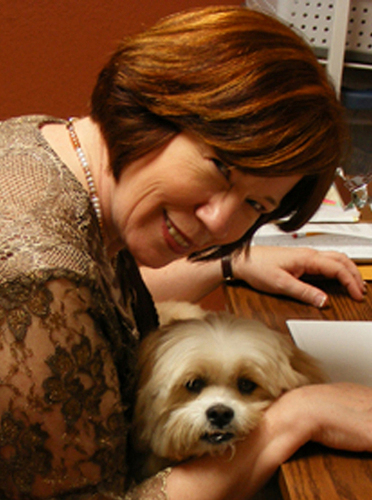 I sit down with many of my customers to help them finish projects." Arts and crafts have long been used to help people express their feelings and find peace, Siegel said. Debbie McCoy and her dog, Chewie Ed Gerber, a k a Txrockhound, is offering this rare red and black plume agate from the Woodward Ranch.